This recipe was not the recipe I had planned for this week. 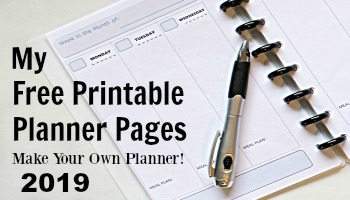 My original plan was to share a recipe for homemade eggnog made with EggBeaters (an egg substitute), one of the recipes I found while sorting through a box of old recipes my mom had cut out and saved over the years. But as can sometimes be the case with my DIY adventures, not everything that looks good on paper will actually turn out good in reality. This eggnog didn’t have the same taste or creaminess or smoothness of the real thing and was just plain *blech* It was time to move on to Plan B. And Plan B was to share this recipe for Glazed Almond Bars that I was SURE would turn out because I’ve been making it for over 20 years! Even though I’ve had this recipe a long time, it’s not a recipe that I make just any old time. I usually reserve these bars for the holidays or other special occasions, kind of like how I don’t make fudge unless it’s Christmas. 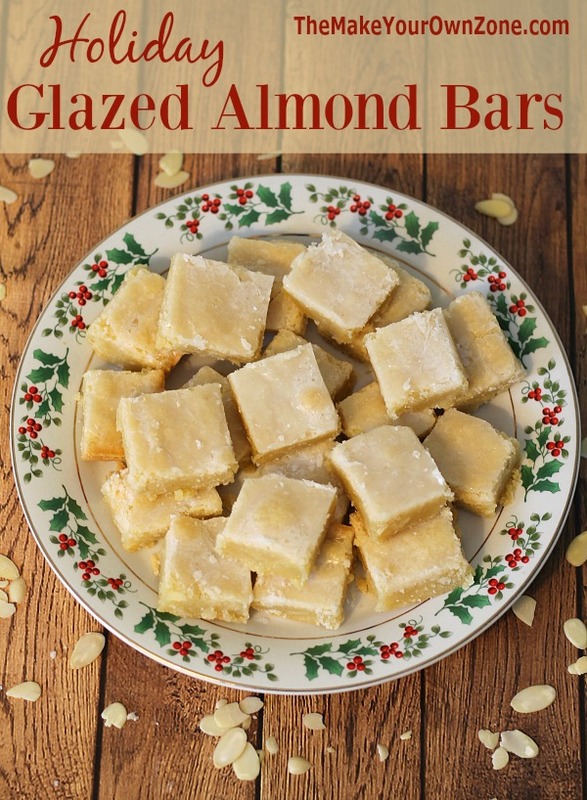 These bars are rich, decadent treats that I cut into small pieces and they make a nice addition to a plate of goodies to bring to gatherings or for gifting during the holidays. 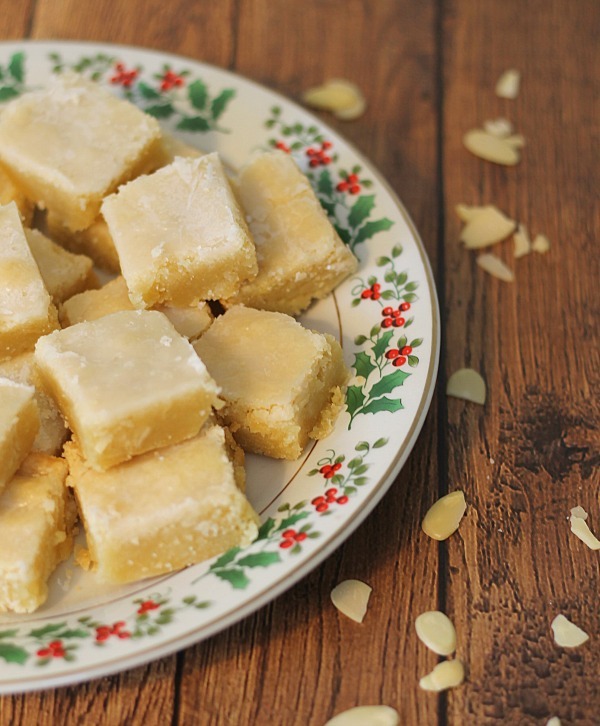 Another reason I only make this recipe during the holidays is because of the somewhat troublesome ingredient of almond paste. . . which is troublesome only because it’s getting harder and harder to find in the stores. But apparently the stores will give this ingredient some priority during the holidays when I often CAN find it. In fact last year my local Meijer had it on the center aisle display with other baking goodies. Oh happy day! I made sure I bought at least a couple boxes because who knows when I would be able to find it again. Sometimes I can find the boxes (or sometimes cans) of almond paste in my local “Dutch” store that imports many things from the Netherlands (because there’s still a lot of us Dutch folks here in Grand Rapids, Michigan!). I can also sometimes find this ingredient with other “International” items in larger stores. 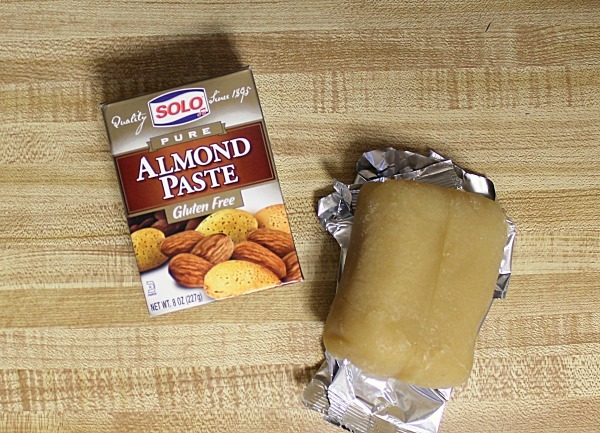 You can also find almond paste on Amazon (for a price of course), and if it gets to the point when I can’t find it, I have this article pinned on Pinterest with instructions on how to make my own almond paste (which I might just try for fun anyway!) If you’ve never worked with almond paste, it comes in a dense, soft lump of goodness that mixes in nicely to your baked goods. In a large mixing bowl, cream together the butter and almond paste with an electric mixer. Then beat in the sugar and eggs. Next, mix in the flour and salt. The mixture will become thicker at this point and I usually switch from using my electric mixer to just mixing in the flour by hand. Finally, stir in the slivered almonds. Pat the mixture into a greased 9×13 pan. Bake at 300 degrees for 40 minutes or until just starting to brown around the edges. Glaze the bars while still warm. Combine the glaze ingredients and pour over the bars. Let the glaze harden up before cutting bars. Another yummy almond flavored treat are these Almond “Brownie” Bars, a recipe that simply uses almond extract with no need to go in search of almond paste. I also put almond extract in my Brown Sugar Body Scrub because almond extract smells wonderful too! I haven’t checked yet this holiday season, but in the past Meijer has sold 10 oz shrink wrap packages of almond paste. They were displayed near refrigerated cookie dough. Thanks for that tip Judy – I will have to check out that area of my Meijer store. If your from Grand Rapids, check out Horrocks! Sometimes they run specials in whole tubes of almond paste for a ridiculously low price!! !